How do I import assignment groups from PowerSchool? 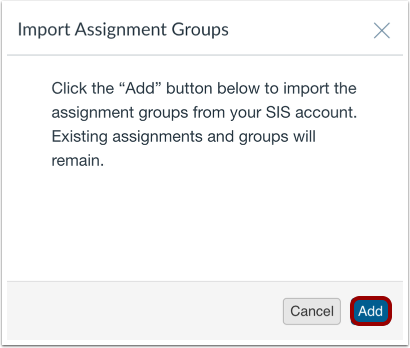 If your institution is using PowerTeacher Pro in the PowerSchool student information system (SIS), you can import assignment groups from PowerTeacher Pro. Assignment groups are collected and verified every 24 hours to be imported into Canvas. 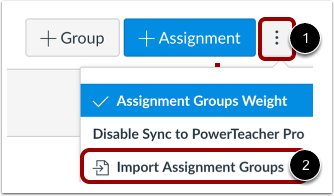 If you choose to use this feature for PowerTeacher Pro, you must import all assignment groups into Canvas before adding assignments in Canvas. Canvas assignments will not be synced to PowerTeacher Pro unless they are located in the default assignment group or in a group imported from PowerTeacher Pro. 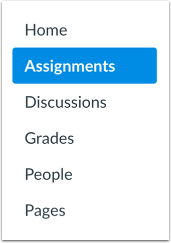 Imported groups include an import icon to identify them from manually created assignment groups in Canvas. If your course includes multiple sections in PowerTeacher Pro, each section must have the same number of assignment groups (categories) with the same names. For instance, if one section in PowerTeacher Pro includes four categories, and another section includes three categories, you will need to create another category in the second section so that each section contains four categories. Assignment groups cannot be imported from the legacy PowerTeacher gradebook. PowerTeacher does not support assignment group imports. However, you can manually create assignment groups that match the assignment groups in the PowerSchool PowerTeacher gradebook. Click the Options menu , then click the Import Assignment Groups option . In the Import Assignment Groups window, click the Add button. View the groups imported from PowerTeacherPro. Note: If an assignment group is not imported, the assignment group may not yet be verified for import. Try importing the groups again in 24 hours. Previous Topic:How do I set up an assignment to be sent to my institution's student information system (SIS)? Next Topic:How do I use the Roll Call Attendance tool in a course? Table of Contents > Assignments > How do I import assignment groups from PowerSchool? I don't have any suggestions beyond what you're already doing. I would recommend posting this question in the general Community Q&A as it may gain more visibility there and you may get input from other users who also use PowerSchool. You can do so by going here: Q & A and clicking the Ask a Question button. I saw your question in the general community and I hope that you'll get some good responses soon. I did want to follow up here and let you know that we periodically archive comments on the guides, so this thread will be archived in about six weeks. Please don't hesitate to reach out with any other questions you might have.